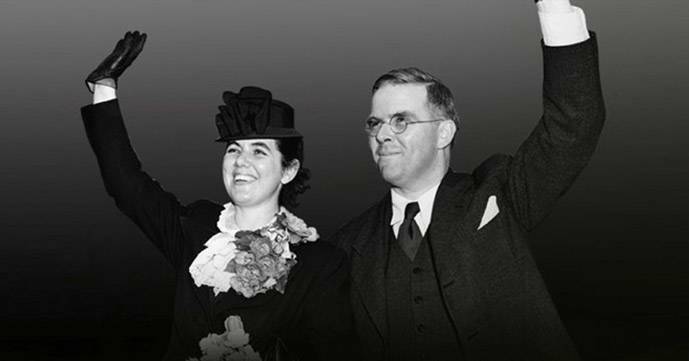 DEFYING THE NAZIS: THE SHARPS’ WAR, a new documentary co-directed by Ken Burns and Artemis Joukowsky about a little-known but important mission by an American minister and his wife to rescue refugees and dissidents in Europe before and after the start of World War II, will air on September 20 at 8 p.m. on OETA. A trailer for DEFYING THE NAZIS is available here. Artemis Joukowsky, a film producer and co-founder of No Limits Media, is the grandson of Waitstill and Martha Sharp and has spent decades researching their story. He is the author of a companion book to the film, featuring a foreword by Ken Burns, which will be published by Beacon Press and released on September 6. “Beyond the cloak-and-dagger suspense of my grandparents’ experience, it is a story of what America meant to refugees fleeing war-torn countries to build new lives. And it underscores what Waitstill would call ‘a collaborative effort’ of how a small but effective underground network of rescue workers saved as many lives as they could, and how important that lesson is for what is happening today,” said Joukowsky. In addition, WETA, the presenting public television station for DEFYING THE NAZIS, has partnered with Facing History and Ourselves, one of the world’s most respected educational organizations. FHAO is dedicated to raising students’ awareness of injustice and intolerance. Together WETA and FHAO are creating curriculum materials to help middle and high school teachers use the film and additional primary sources to engage students in the Sharps’ story of sacrifice, rescue and moral courage. Materials will be available free to schools through PBS’ LearningMedia Services. Funding is provided by members of The Better Angels Society including Jan and Rick Cohen and Jonathan and Jeannie Lavine; The Starr Foundation; The Threshold Foundation; and donations from individuals. DEFYING THE NAZIS: THE SHARPS' WAR is a co-production of NO LIMITS MEDIA, Inc., and Florentine Films, in association with WETA Washington, D.C. A film by Ken Burns and Artemis Joukowsky. Produced by Ken Burns and Matthew Justus, Ken Burns: Executive Producer. Edited by Erik Angra. Music by Sheldon Mirowitz. Copyright: Farm Pond Pictures, LLC. WETA Washington, D.C., is the third-largest producing station for public television. Other WETA productions and co-productions include PBS NEWSHOUR, WASHINGTON WEEK WITH GWEN IFILL, THE KENNEDY CENTER MARK TWAIN PRIZE, IN PERFORMANCE AT THE WHITE HOUSE, THE LIBRARY OF CONGRESS GERSHWIN PRIZE FOR POPULAR SONG and documentaries by filmmaker Ken Burns, including THE CIVIL WAR, BASEBALL, THE WAR, THE NATIONAL PARKS: AMERICA’S BEST IDEA, THE CENTRAL PARK FIVE and THE ROOSEVELTS: AN INTIMATE HISTORY. More information on WETA and its programs and services is available at www.weta.org.